AirNet's rapidly deployable technology solves the problem of getting a reliable communications system up and running when and where it is needed, FAST! AirNet's award winning AdaptaCell® software-defined radio (SDR) and the AirSite® Backhaul Free base station products have brought significant benefits to the field of wireless communications. The flexibility and software driven capabilities allow these technologies to be adapted to fit any number of voice and data communication applications for government, public safety, military, and homeland defense applications. Versatile: The RapidCell Base Station supports the versatility of commercial GSM wireless technology. Available in four GSM frequency bands, GSM-850, GSM-900, GSM-1800 and GSM-1900, the RapidCell supports any commercial GSM mobile phone. Up to 96 channels of capacity can be supported in this compact base station package. 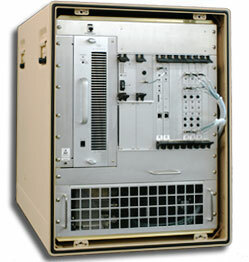 Adaptable: The RapidCell Base Station supports multiple modes of operation. First, it may operate in a stand-alone mode, supporting mobile-to-mobile communications, without any external network equipment. In this mode, RapidCell may also be configured to support AirNet's AirSite Backhaul Free base station supporting up to 12 cells of GSM coverage. Second, RapidCell may support the GSM Abis interface to GSM core infrastructure, providing all the capabilities and mobility that the GSM wireless standard provides. Third, the RapidCell supports an ISDN PRI interface. This will allow connectivity for GSM mobile handsets to nearly any existing telecommunication switch or PBX including direct connection to the PSTN without requiring expensive GSM core infrastructure equipment. Both the GSM Abis and ISDN PRI interfaces support backhaul to network equipment via a satellite link, allowing quick deployment of GSM coverage to remote areas. Additionally, the RapidCell will support packet data interface via IP including VoIP support with only a software upgrade. Software Upgradeable: The core architecture of the RapidCell is based on AirNet's Software Defined Radio hardware architecture. The flexibility of the architecture allows future capabilities such as GPRS, EDGE and VoIP to be added to the RapidCell with software only upgrades. Secure: RapidCell supports the most secure communications capabilities of any commercial cellular standard provided with GSM user authentication and encryption. Additionally, the RapidCell has been tested and verified to support the higher levels of secure communications using type 1 and type 4 NSA encryption enabled GSM mobile phones.